In the unfolding drama of TripAdvisor vs. Fake Reviews that has played out in various travel publications, HolidayCheck has upped the stakes by trumpeting its differences with TripAdvisor relative to the integrity of hotel reviews. HolidayCheck claims to have 20 million visitors a month, and since it’s available in 10 languages, it’s the self-proclaimed market leader in Germany, Switzerland, Austria and Poland. Like TripAdvisor, it offers a steady collection of hotel reviews, images and tips for vacations. So where do HolidayCheck and TripAdvisor part company relative to authenticating reviews? Automated systems can alert to fakes, but can’t determine if a review is actually a fake. Keller says their “fraud detection” department cuts down on fake reviews significantly. • And it seems that when a hotel complains about fake reviews, TripAdvisor sends an automated email and the review is rarely if ever removed. I know this for a fact in at least one case. 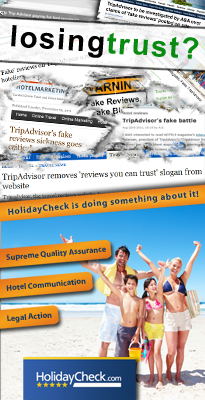 • HolidayCheck gives hoteliers real people to talk to about suspect reviews. Those complaints are then passed on to the “Fraud Detection” team. The review is checked again, and if it’s found to be fraudulent, it’s taken down, and only reposted after it’s proven genuine. HolidayCheck has some 16 criteria it uses to measure a review’s authenticity. These include, according to Hotelmarketing.com, tourist language, bad language and the IP address used. If a review is suspected of being a fake then a confirmation of booking is requested. Genuine reviews which were written using the hotel’s IP address are not, therefore, flagged unfairly. The issue of a hotel’s being blackmailed by guests seeking special treatment or else, is taken very seriously by HolidayCheck. Belatedly, it seems, by TripAdvisor. If, as Hotelmarkteting points out, a hotel tells HolidayCheck’s Hotel Communication team that they have been or may be blackmailed, those reviews undergo extra scrutiny before being released. How important are reviews to the success of a travel enterprise, especially hotels? “Had a great week at this Hotel, thanks to beautiful weather, lovely pool area and friendly staff. The entertainment staff were very friendly and chatty, speaking good English and encouraging everyone to make the most of their holiday. Some reviews, though, are written by people for whom English is not a first language, and they are sometimes a bit stilted. But their valuations and opinions are quite clear. 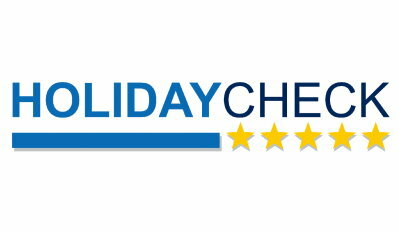 But, the real message to hotels from Holidaycheck is simply, that the best way to improve ratings is to improve services and communicate effectively with your customers. Next: Should Travel Writers Ask for Free Trips or Get Paid by a Destination? There are always going to be a modest amount of fake reviews and to a larger extent over-exaggerated reviews on these types of sites. Really though, is it any different seeing them from consumers instead of talking heads on television or voices on the radio? You must always be conscious of the fact that everyone has a different opinion and definition of good vs. bad in hotels. Do you research but take the whole picture into account, not just one site or one review and you’ll likely come out fine. Thanks for writing in, Brian. And yes, look for our next post on why travel writers should not take free trips. The post addresses your concerns about the similarity between “biased” review from professionals and from consumers. However, the point I would make is this: TripAdvisor should have been more diligent, less cavalier, about its approach to verification. I think they were insensitive to many of the concerns and issues hotelier raised as TA grew in power and influence. Hubris? Probably not. They probably just didn’t plan for human intervention in authenticating the legitimacy of a review, never thinking, perhaps, they needed to go beyond robotic postings or needed to be more alerts and responsive.